If you are looking for a way to take your sleep to the next level, take a serious look at the Tempur-Ergo, now offered by Best Mattress. Designed to provide an unlimited number of sleep positions, this powerful adjustable mattress base is available in Twin, Twin Long, Double, Split Queen, Queen, Split King, and Split California King sizes. Here are just a few of the features and reasons why we love the Tempu-Ergo, and why you’ll want to visit one of our sleep experts at Best Mattress today! TEMPUR-Ergo® Premier Adjustable Base puts control of your sleeping position back in your hands with an impressive variety of positions, each with their own benefits. A conveniently wireless remote allows you to easily get to that perfect comfort position as it electronically adjusts to your every whim. Unlimited Ergonomic Positions: Raise head up to 57° and feet up to 46° for perfect support while the wall-hugging design keeps you near the nightstand. Massage: 2 unique massage settings for your relaxation, de-stressing, and comfort. Every person’s preferred sleeping style and position is entirely unique to their own body and preferences, which is why the Tempur-Ergo Plus gives owners the opportunity to adapt both the head and foot sections of your bed. 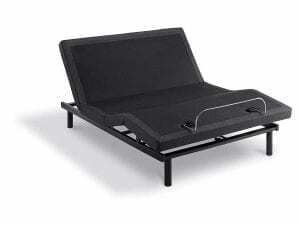 The head portion of the adjustable base which allows users to increase the incline up to 57°, perfect for anyone who likes to use their laptop in bed or watch television. The foot portion of the foundation can is adjustable and can be raised up to 46°, allowing bed users to raise their feet, taking pressure off their legs and improving circulation. A second added perk to raised feet is that elevating your legs can often alleviate pressure from your circulatory system reducing pain and swelling from your lower extremities. Equipped with a wireless remote, the Tempur-Ergo enables owners the ability to store their remote wherever they deem most convenient. In the event of a power outage, the bed can be lowered back to a neutral flat position, so that users don’t have to worry about getting stuck in a reading, tv watching or eating position when they’re ready to go to bed. The wireless remote of the Tempur-Ergo also gives users the opportunity to store two preset positions, letting you quickly go from one position to another with the touch of a button. The Tempur-Ergo Plus comes with 12-inch legs that can be replaced with lower 9, 6.5, or 4.5-inch legs that can be added or removed to get your bed into the perfect height for your needs. The opportunity to adjust your bed height can make it easier to get into and out of your bed, or to use the space underneath your sleeping area for storage. The Tempur-Ergo gives you the power to transition to the next position quickly and smoothly so you won’t have to wait long to get into your favorite sleeping position. The powerful motors offer full lift within thirty seconds of adjusting the remote, making it easy to get to sleep. Every room is configured a little bit differently, and the Tempur-Ergo will not interfere with your décor or furniture choices. 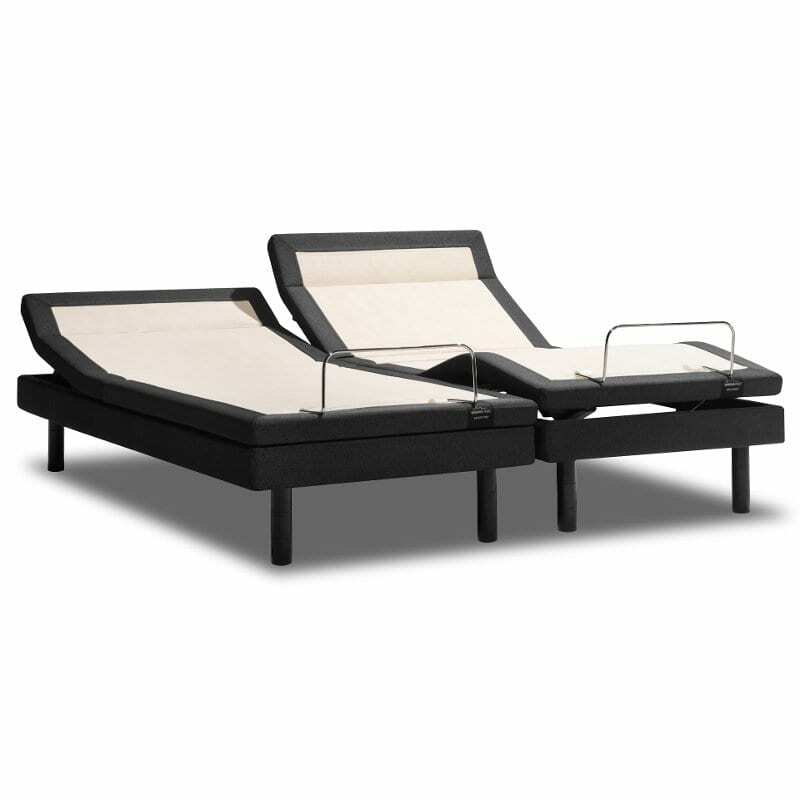 Designed to be compatible with standard sized bed frames, the Tempur-Ergo Plus blends in seamlessly to any room style. With a convenient wall-hugging design, the system doesn’t have clearance requirements, allowing you to push your bed flush against a nightstand or wall. 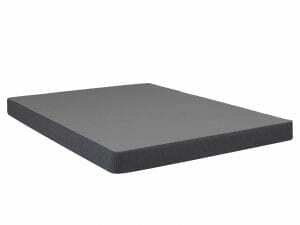 Strong, sleek retainer bars on the end of the bed keep the mattress in place while being easy to walk around. You not only deserve an adjustable mattress that operates silently, but you need one too. Noisy motors can bring you out of a restful state when adjusting positions whereas a quiet motor will allow you to stay in that peaceful state and quickly return to sleep. This is why the Tempur-Ergo has a powerful drive motor with strong pulling and pushing power. 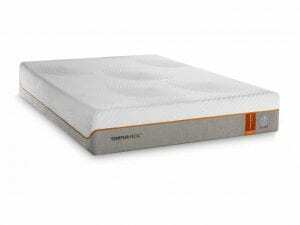 The system is designed to move the mattress silently, allowing you—and your partner—to sleep soundly. Each Tempur-Ergo comes along with a generous complimentary manufacturer’s warranty, covering owners in the event of electrical failure and manufacturer’s defects. 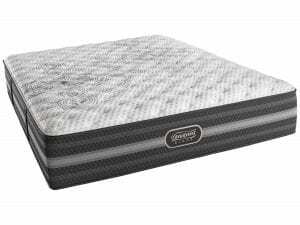 The Tempur-Ergo is covered on both parts and labor for the first year, and parts for an additional four years with Tempur-Pedic taking care of costs due to electrical failure, motor problems, or part replacement. The frame itself is covered for 25 years, allowing you to sleep easily. Our team also specializes in providing free in-home set-up for new mattress sets, including adjustable bed frames. Whether you need those new mattresses in that new basement bedroom or you are concerned about clearance requirements for your adjustable bed frame, our technicians can take care of you. Our staff also believes in keeping homes clean, which is why they will take all trash, boxes, and wrapping materials with them when they go. After you start using a new mattress, it can take your body a little while to adjust to the new sleeping surface. If you have owned your mattress for longer than 30 days and you aren’t happy with your set, Best Mattress is glad to exchange your mattress for 120 days from the date of purchase without any restocking fees. If you choose to return your mattress for a full refund, you can do so within 120 days, after a 20% restocking fee and a small delivery fee. If you want to explore an incredible variety of mattress brands and Tempur-Pedic products in Las Vegas, visit Best Mattress today. With a dedication to quality and a focus on creating a pressure-free shopping environment, these sleep experts make finding the perfect mattress or base easy.